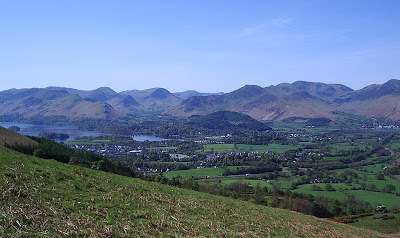 Ever since my outing on to Ling Fell yesterday I have been bugged by not knowing for sure whether the problems I experienced with the VX-8GR were really caused by receiver overload or blocking. I like the construction and features of the Yaesu. But a radio that makes you miss some of the contacts you have laboriously sweated up a summit to make is about as much use as a chocolate teapot. I wondered if I could devise a test to give me an idea of the relative strengths of the different 2m radios. I did, and the candidates are lined up in order of merit below, the worst on the left and the best on the right. The test methodology was crude. I connected each radio to my dual band vertical and tuned in a weakish station: the GB3AS repeater on 145.600MHz, which is normally an S3 signal - fully readable but with some background noise on the audio. I then transmitted a carrier on 144.025MHz using another radio on a helical antenna a few metres from the vertical. I tried two power levels of the interfering signal, 3.5W ("high power") and 0.5W ("low power"), these being the available power levels of the test radio. This 8dB difference in the interfering signal level had different effects on the ability to receive the repeater signal. I am well aware of the limitations of the test I carried out. In real life SOTA or WOTA use a radio may be subjected to strong in-band signals from activators on other summits but they will not be as strong as the signal from a radio a few metres away from the antenna. A radio is likely to be subjected to strong signals from outside the amateur band such as pagers and other commercial signals, which the bandpass filters in modern radios due to the marketing-driven necessity of providing wideband receive coverage will do nothing to attenuate. Many strong signals may mix together to cause intermodulation effects if not blocking. However, a receiver that can handle a strong in-band interfering signal is likely also to be better at coping with many strong signals being received over a range of frequencies. So I think my test results have some validity. Beginning with the worst receiver, the results are as follows. VX-8GR. This receiver was the worst affected by blocking. Noticeable desensing of the repeater signal occurred when the in-band carrier was on low power, while a weak noisy "4 by 1" signal was killed completely. The repeater signal cut out completely when the in-band carrier was keyed on high power. Engaging the RX ATT (menu option 1) caused the repeater signal to drop below the squelch threshold so it was not much help though it did reduce the desensing effect on stronger signals. JMT-228. The VX-8 was slightly worse than the Jin Ma Tong JT-228, a £30 Chinese handheld bought on eBay. In fairness, the JT-228 is slightly less sensitive than the Japanese ham radios (judging by the signal to noise ratio on weak signals) which may have helped it a bit. Desensing was noticed when the in-band carrier was on low power, and the repeater signal cut out when it was on high power. TH-D72. The Kenwood TH-D72 may only be third worst (or third best) but in fact it was a whole lot better. No detectable desensing occurred when the in-band carrier was on low power. Some desensing occurred, in the form of a drop in S-meter reading and increased noise on the audio, when the carrier was on high power. GP-300. 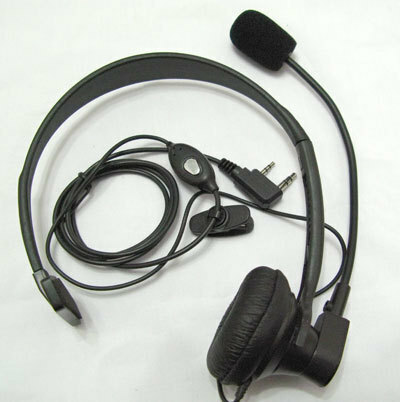 Excellent performance was given by the Motorola GP-300. No desensing was noticed when the in-band carrier was on low power. There was a very slight but hardly noticeable increase in background noise level when the carrier was keyed on high power. TH-205E. I bought this old boat anchor as a "spares or repair" radio for £6 on eBay for the fun of seeing if I could get it going. With the high capacity battery pack it is about the weight and bulk of an FT-817 and not something I would particularly want to haul up a summit. But no desensing of the repeater signal was observed even when the in-band carrier was keyed on high power, making this the best performing receiver of all. Out of interest I also carried out the test on my FT-817ND and the Kenwood TM-D710 I use as my 2m base station. The FT-817ND was slightly better than the TH-D72: there was no effect with the low power carrier but the high power one brought a noticeable background hiss on the signal. The TM-D710 performed close to the TH-205E. There was barely any noticeable effect from the high power in-band carrier. I think the results of these tests, crude though they are, are interesting. The bigger the radio, the more likely it is to have a receiver able to handle adjacent strong signals. Paying lots of money for the latest technology is no guarantee of getting a better receiver. In fact, just the opposite. An ex-commercial handheld or a ham band one from the days when wide band receive coverage was not considered important will work better than the latest marvels. Were it not that I find the full APRS functionality of the VX-8GR and TH-D72 useful, I'd be tempted to sell both those radios and just use a dumb tracker plugged into the mic socket of one of the others tuned to 144.800. Either I use the VX-8GR for APRS only and carry another radio for making contacts or I must try harder to love the TH-D72. Decisions, decisions. But at least I now have a bit more information to base them on. This afternoon I went for a stroll up Ling Fell, LDW-205. It was a fine afternoon and I wanted a bit of exercise. I took the VX-8GR so I could test the new QRU feature of Lynn KJ4ERJ's APRSISCE/32 software that allows an APRS user to receive information about nearby objects on request. I have created a QRU server for Wainwright summits so that an APRS user in the fells could receive information about the nearest summits, to aid identification or navigation. I put a 2m helical antenna on the rucksack support for the walk up, so the VX-8GR could send my position. The other channel was monitoring 145.500MHz (S20) the FM calling channel. As I gained height I started to hear some loud bursts of interference, a combination of a whine and a buzz, on S20. When I got to the top I switched antennas to the RH-770 dual band telescopic. My first call was answered by Colin, 2E0XSD. His signal was moving the meter on the VX-8GR to an S3 or 4 but there was intermittently a lot of crackly interference over his audio. I tried engaging the RX Attenuator option in the VX-8GR menu and it did seem to improve things a bit, but not completely. A bit later, when I was testing the QRU server, I could hear the APRS packets coming back from my gateway (which is line of sight from Ling Fell, just behind me in the distance in the picture) but they sounded distorted and the VX-8GR didn't decode them. I wondered if there was a fault with the cable to the rucksack mount so I put the antenna directly on the radio. My next call was answered by Geoff G4WHA from his car in the car park in Penrith. He was 5 by 1 but his signal was cutting out intermittently. I got the feeling the problem wasn't Geoff's, but was my receiver cutting out due to overload from some nearby transmitter. There is a commercial mast a couple of miles away on the other side of the valley, though I have no idea what is on it. I am starting to get a feeling that the receiver in the VX-8GR is not much good on summits when connected to a decent antenna. I first noticed odd things with the original VX-8R I had when I tried it out with a SOTA Beams MFD. There have also been several occasions when other people using VX-8 series rigs on summits have failed to hear me, even though I could hear them clearly and in some cases was running much more power than they were. This is quite disappointing. I really like the VX-8GR and much prefer it over the Kenwood TH-D72 which I have been thinking about selling. But perhaps it would be better to keep the Kenwood. 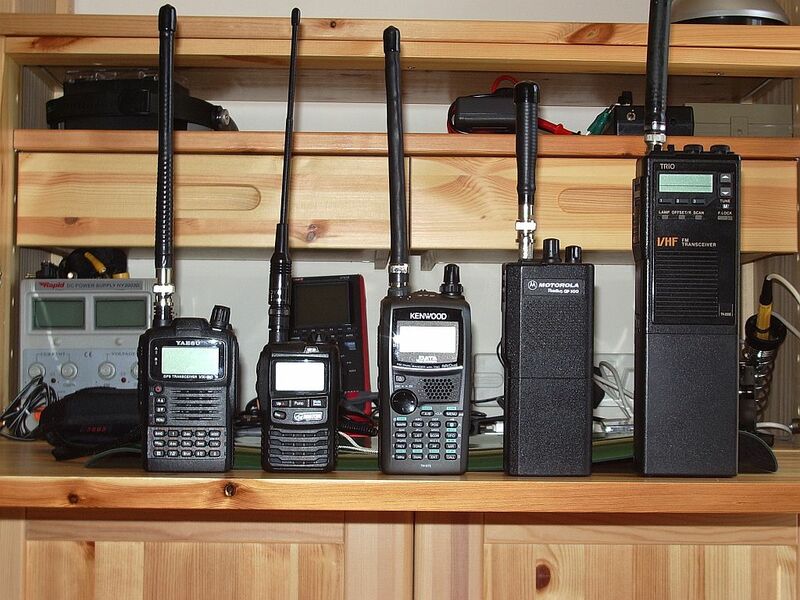 I wish that I had the test equipment to try to compare the strong signal performance of my various hand held radios. 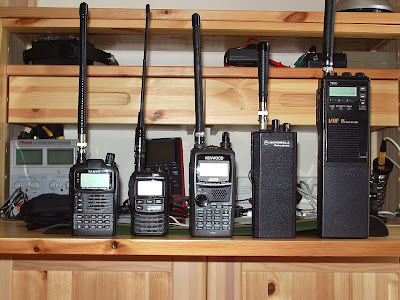 HF radios have their receiver performance exhaustively tested and the results of tests by the likes of Sherwood Labs are endlessly debated on various reflectors despite the fact that the only difference it is likely to make is whether you can copy a very weak station right next door to an extremely strong one. But the reviews of VHF radios focus only on matters like the ease of use of the menu system, how many memories it has or how the scanning works. I think the receive performance of VHF/UHF hand helds is just as important as for HF receivers. If a receiver can't cope on a hilltop on the middle of nowhere how will it fare with the signal levels in a busy urban environment? Heck, you might be missing vital emcomms messages and not know it! It's about time the ham radio magazines started publishing blocking dynamic range and cross-mod figures for hand held radios. 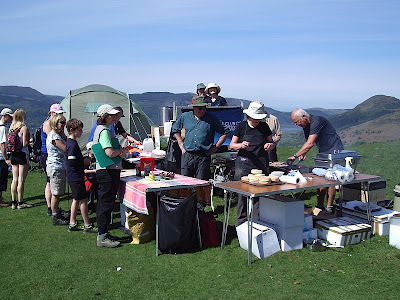 For Easter Sunday, Bassenthwaite Rotary Club of which fellow WOTA enthusiast Phil M0AYB is a member put on, in aid of charity, a Felltop Café on the summit of Latrigg, a very minor but frequently visited Wainwright summit just to the north of Keswick. Phil planned to activate the summit while he was there. The opportunity to have coffee and cakes while activating a summit was too good to resist so I decided to pay Phil a visit and do my own activation. The weather played fair and was glorious, too. Latrigg is an easy summit - really a foothill of Skiddaw - and so it was not too much of a problem for my back which is better but still not fully recovered. 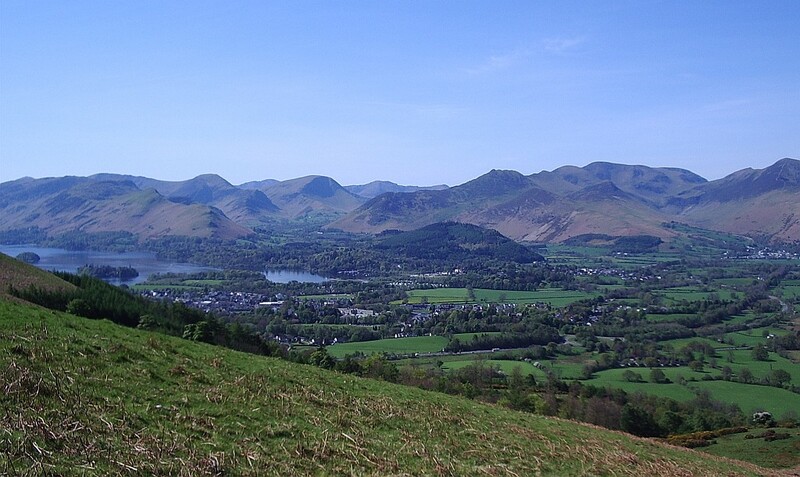 The views on the way up are glorious, which is why Latrigg is a popular target for visitors to the area. 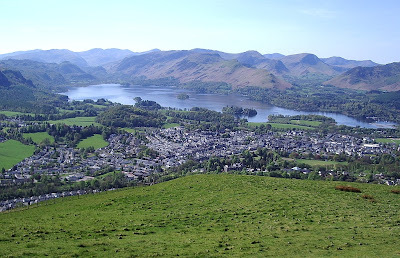 From the summit you look down to the town of Keswick, with its lake, Derwentwater, beyond. 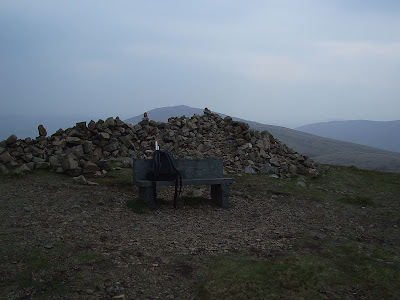 Soon after we arrived I heard Richard G1JTD/P on Yoke in the Eastern Fells, and worked him for a summit to summit. Yoke was not a summit I'd have much hope of working from home so that was a bonus. Olga and I went and got some coffee and Cumberland sausages in a bap from the café. The coffee was excellent. There was quite a queue for refreshments and I hope the enterprise made a lot of money for Bassenthwaite Rotary Club's charity. 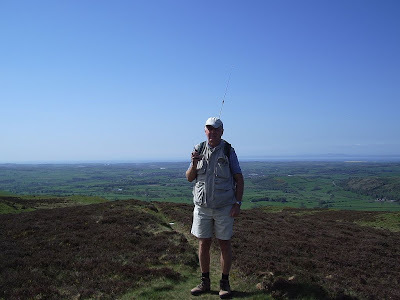 Phil had brought up a 9 element Tonna on a short mast which he was using with an FT-817 running 2.5W. I was using the Nagoya NA-767 mentioned in my previous post on comparing handheld antennas with the Kenwood TH-D72 and 5W output (though not in the picture.) I worked most of the same stations Phil had, and some of them commented that my signal was similar or close to as strong as Phil's, which was quite gratifying. This was the first activation I have done with the TH-D72. I have been hoping that in time I would grow to like this radio but I'm afraid it has not won me over. It's too big and bulky and the case feels plasticky and not rugged enough to stand the knocks and bumps experienced on a summit. I still prefer the VX-8GR, though as noted in previous posts the receiver of that gets easily de-sensed in the presence of the strong signals experienced on a hilltop with a good antenna. I've been wanting to do this for a long time. I wanted to try to compare the difference between various antennas for 2 metre band handhelds so as to see how much you lose using a small inconspicuous antenna or how much you gain by using an extra long one. The results were broadly as expected. The longer the better. But there were a couple of surprises. The efficiency of the antennas was compared using my Yaege FC-1 frequency counter, which has a relative dBm scale. I transmitted into each of the antennas in turn, noting the dBm reading on the FC-1 which was positioned a couple of metres away. This is hardly an antenna test range. However, the results were validated in on-air tests where various local amateurs were asked to report on my signal strength as I swapped antennas. The on-air results were in agreement with the measurements, which allow me to believe that they are a fair representation of the performance of these antennas in the real world. As an aid to comparison, the performance is given as effective power out relative to a manufacturer supplied antenna driven with 5 watts. The antenna provided with the Yaesu VX-8GR is used as the reference antenna. Choosing a manufacturer supplied antenna turned out to be rather a poor reference, as although the Yaesu standard antenna performs very well, the antenna supplied with the Kenwood TH-D72 performed very poorly. It was 5dB down on the Yaesu antenna, putting it in the same range as the short stubby antennas. This is probably because the Kenwood antenna's resonant frequency, as checked on my antenna analyzer, is around 158MHz. Although it would be reasonable to suspect a fault with the antenna supplied with my TH-D72, the one supplied with my Kenwood TH-F7E (which I have since sold) was identical. If you are using a Kenwood radio then you have even more reason to throw away the supplied antenna and buy a better one. A dummy load. This is just my little joke! Many "experts" like to say that the short stubby antennas are no better than dummy loads. In fact, my results suggest that they perform quite well for their size and are much better than dummy loads. However, as with all of these antennas, the best results depend on the antenna being resonant (having a good SWR) at 145MHz. All these antennas have quite a narrow bandwidth and if they are off-frequency it has a significant effect on their performance. A 2in. 144MHz stubby bought on eBay. This antenna is 5dB down on the reference Yaesu dual-band whip and would be the equivalent of reducing power on the handheld from 5W to 1.5W. An A-137 dual band stubby bought on eBay. I have two of these. The first one was tuned spot on 145.5MHz so I got a second one which was resonant just above 146MHz. Performance is slightly better than the single band stubby, being the same as reducing power to 2W. A 2m Stubby Duck from Smiley Antenna. I got this because I thought it would deliver better performance than the small stubbies while still being small enough to sit comfortably in a pocket. This proved correct. Performance is just 2dB down on the reference stock antenna, the equivalent of running 3W instead of 5W. A 6in. 2m helical antenna. This antenna came with the old TH-205E handheld and as far as I know is the original antenna supplied with the radio. Checked on an antenna analyzer it was resonant a few MHz high in frequency but I brought it down to 145MHz by dropping a ferrite tuning core down inside the helical and securing it with Blu-Tack. This enabled me to open a repeater I could not open before the modification, illustrating the importance of tuning these antennas to get best performance. This antenna is just 1dB down on the reference antenna, like using 4W instead of 5W - hardly noticeable. A Nagoya NA-701 dual band BNC antenna. I purchased this antenna as a replacement for the manufacturer supplied antenna due to my converting all my handheld radios over to BNC sockets by permanently fitting adapters. It is almsot exactly the same size as the supplied antenna and its performance is identical to it. An 8in. 2m helical antenna. This antenna was bought as an untuned helical which required cutting to frequency. I got it from Waters and Stanton and it is of extremely poor quality. However, the RF isn't bothered by the shoddy manufacture. It performs exactly the same as the supplied VX-8GR antenna. The antenna supplied with the Yaesu VX-8GR. This is the reference antenna for this comparison. As mentioned above, the antennas supplied with other radios (notably Kenwood) may not be as carefully tuned and may perform more poorly than this. The antenna supplied with the Yaesu FT-817ND. This is slightly bigger than the one supplied with the VX-8GR and has a BNC mount not an SMA. It performs about 1dB better, equivalent to running 6.3W. Adding the tip which makes the antenna work on 6m has no effect on 2m performance. As I have come to expect from Yaesu, this antenna is resonant precisely on 145MHz, as was the one with the original FT-817 that I had many years ago. A quarter wave telescopic BNC whip. 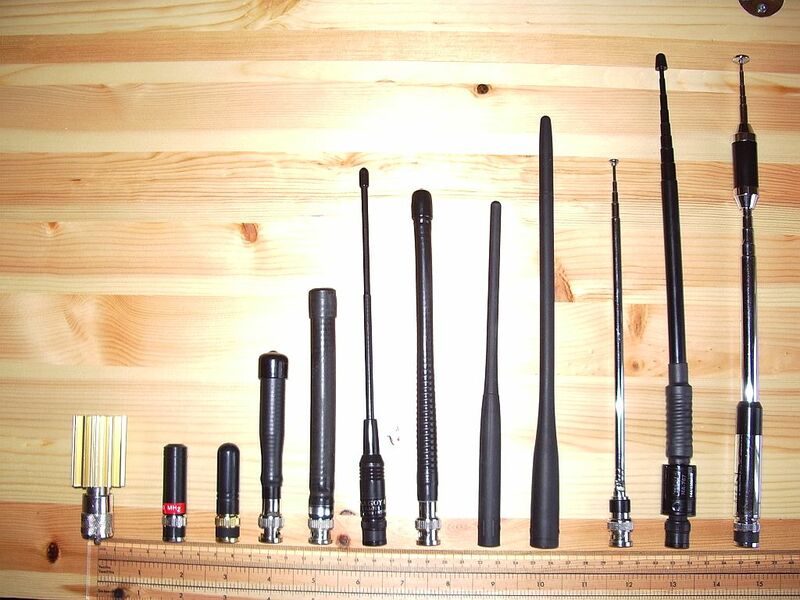 These 19in telescopic antennas are available from a variety of sources. I think this one came originally from Maplin. It gives your signal a 3dB boost, equivalent to doubling your output power (and doubles the received signal strength also.) At a cost of £8, it is a cheap way to double your effective power and not too long to be cumbersome in use. A Nagoya NA-767 bought on eBay. This is a dual band telescopic antenna which is 38 inches (97cm) long when extended. It has a heavy metal base which presumably contains a loading coil. The BNC connector is made mostly of plastic, but the base is sprung which should take some strain off it. The telescopic sections are quite stiff. The build quality of the antenna is not great but it is quite cheap. The performance gain is substantial, giving a 4 times power boost over the quarter wave antenna, equivalent to running 40 watts output. A Sharman RH-770 dual band antenna bought from Capital Stores. This appears to be a clone of the Diamond RH-770 which is sold at the usual rip-off prices by certain ham radio dealers. The Sharman version is half the price. 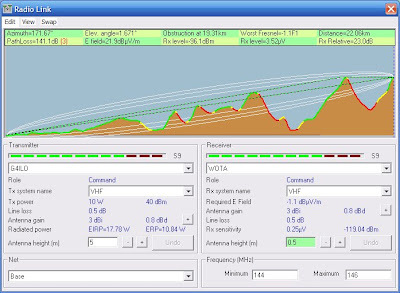 It is a dual band antenna with centre loading and is 93cm (36 inches) long when extended. It looks and feels a better quality antenna than the NA-767. It also performs slightly better on 2m, giving your handheld a full ten times gain on transmit and receive compared to the supplied rubber duck. It's the equivalent of running 50 watts from a handheld! Not shown in the picture is the 45.5inch Black Whip from jeepbangkok on eBay. This is a 5/8 wave single band (2m) antenna and was the best performing handheld 2m antenna of all, giving 11dB of gain over the manufacturer supplied whip, the equivalent of running 63 watts of power! Sadly the telescopic whip was of poor quality and pulled apart during a recent WOTA activation. Clearly one should not use such long antennas as the last three on a typical modern handheld radio with SMA antenna socket unless you are using a stout SMA to BNC adapter that tightens down to rest on the body of the radio so that no twisting moment is applied to the SMA socket. Even then, you may rightly be wary of using such a long antenna in the windy conditions often encountered on Lake District summits, which often bent the sprung base of the Black Whip into a 45 degree angle. Because of this I have made up a rucksack mount with a BNC socket and a 19in. quarter wave counterpoise so these high gain antennas can be used off the radio. 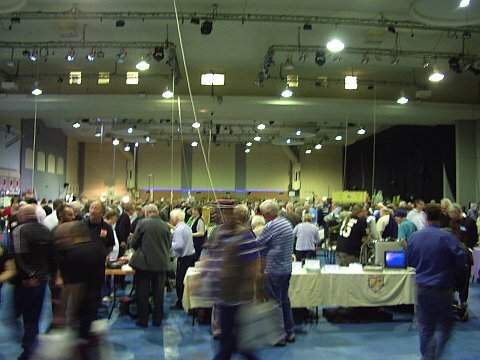 I was unable to test the free standing WOTA Pole (ribbon cable Slim Jim inside a plastic tube) under the same conditions but on-air reports suggest that it may give even more gain than the Black Whip. 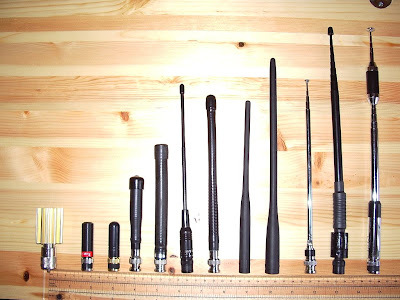 However, it isn't always convenient to set up a guyed antenna on a summit, so one of these telescopic high gain antennas could be the answer to improving your signal when using a handheld radio. These test results have related exclusively to the 2m band. I do not have test equipment that works up to 440MHz, nor is there any activity on 70cm in this part of the world so I have no plans to compare the performance of these antennas on UHF. 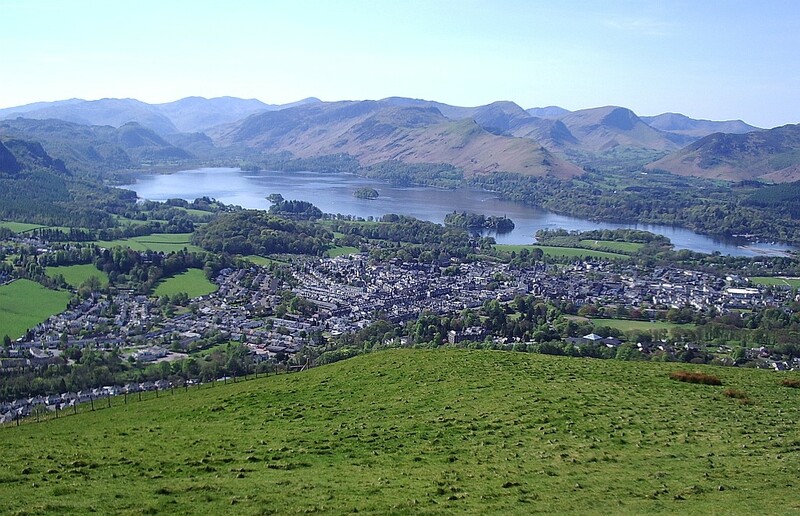 We're enjoying some wonderful weather here in the Lake District at the moment. Unfortunately I haven't been able to get out on the hills for some radio activation. I've been plagued with back pain ever since I returned from Blackpool. But not only that, sometimes I have to go somewhere that is of interest to Olga. 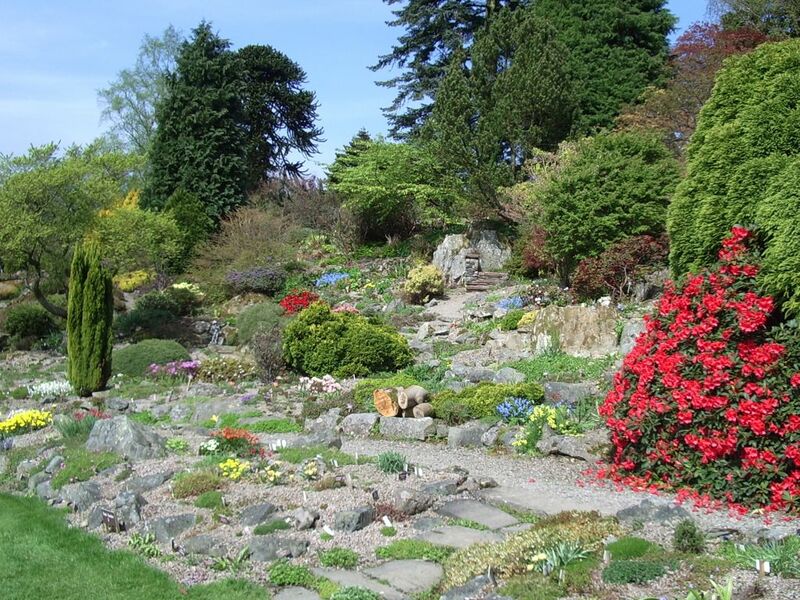 Today we decided to take a drive down to visit Holehird Gardens, home of the Lakeland Horticultural Society. For Olga, who is if anything even more obsessed with gardening than I am with radio, this is like visiting a really big ham radio show would be for me. 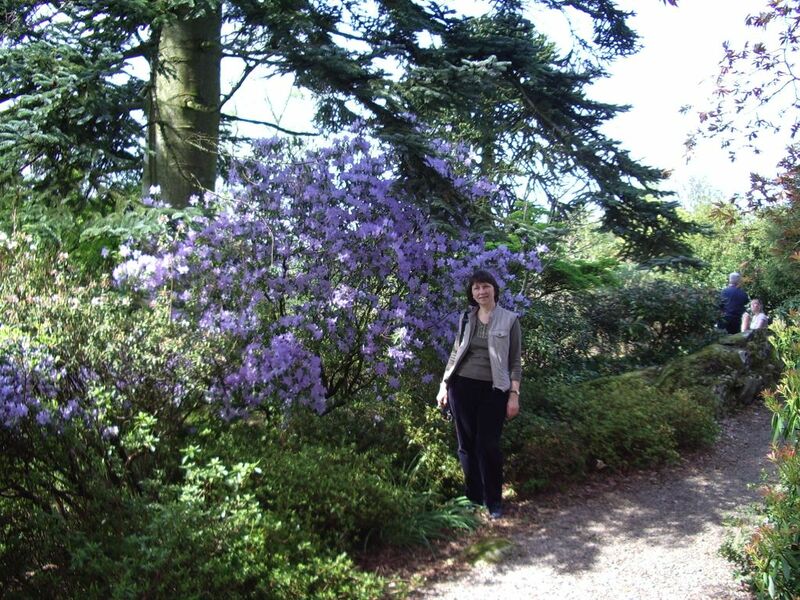 I have zero interest in gardening, but I do enjoy looking at a nice garden, and I enjoyed the day out as much as she did. In fact, we agreed we should visit Holehird more often. I took along the little Jin Ma Tong JT-228 VHF radio because it is small, light and easily slips in a shirt pocket. The antenna was a short stubby helical. 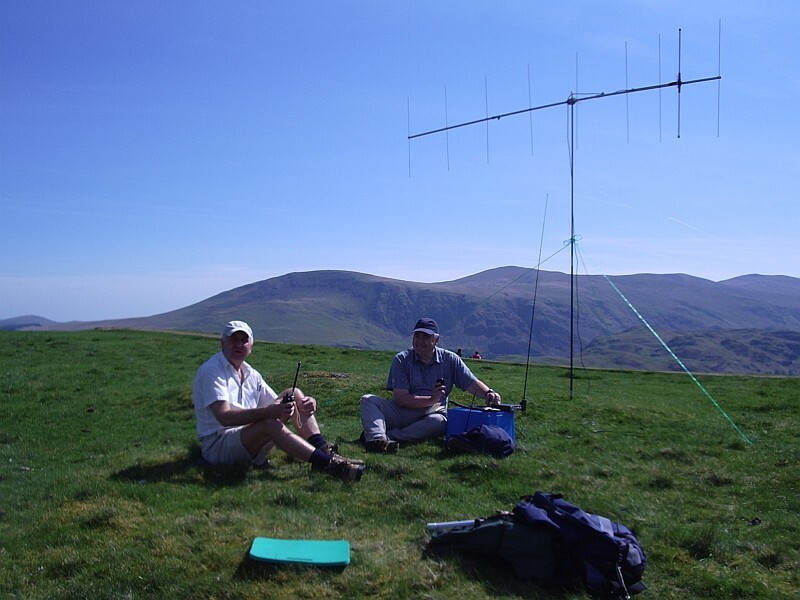 No sooner had we arrived than I heard Phil M0AYB/P calling CQ Wainwrights On The Air from the summit of Great Gable. Phil was rattling off the contacts, and soon heard my call. I was pleased to make a contact using 3W to such a small antenna especially as Phil was also using a stock rubber duck, though according to a panorama engraved on the slate behind me in the picture Great Gable was line of sight from where I was standing so it shouldn't have been too difficult. More was to come, as just after Olga had taken my picture I heard Derek 2E0MIX/P calling CQ WOTA from the summit of Hindscarth. I got in a quick call and Derek heard me first, so we had a quick chat. Hindscarth was not line of sight, I think, but Derek was using his SOTA Beam which made a big difference. 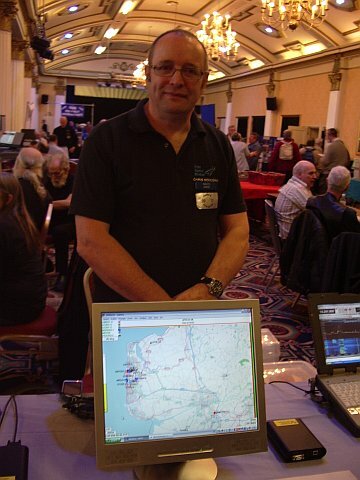 I was well pleased to make two WOTA contacts using the tiny hand-held radio. 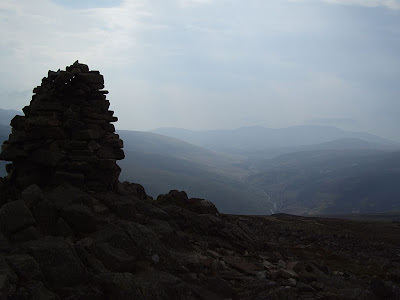 I popped it back in my shirt pocket and carried it around for the rest of the afternoon but didn't hear anyone else although several Wainwright summits were activated. However I was too busy enjoying the wonderful warm weather and beautiful Holehird Gardens to worry too much about the contacts I missed. What this proved to me is that you don't need to be up on the fells to enjoy some WOTA fun. 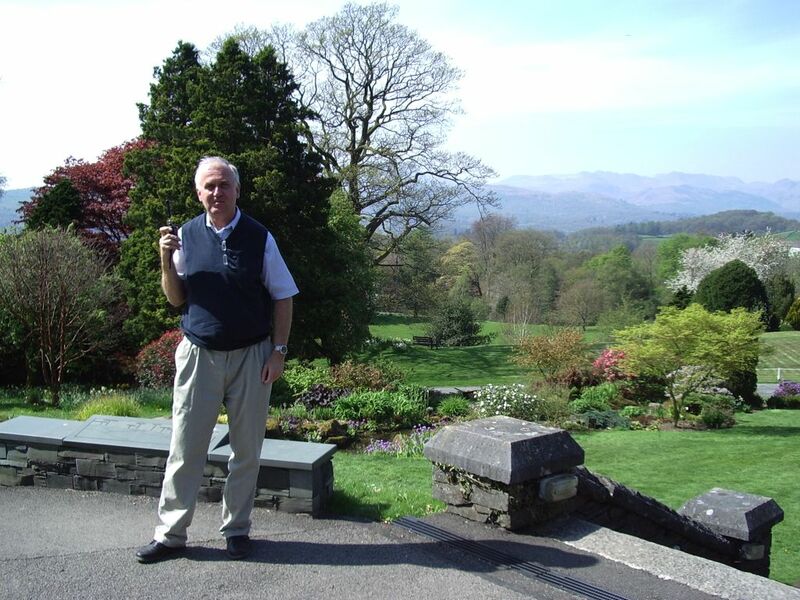 Come to the Lake District and bring a hand-held with you and you'll be sure to make some contacts! 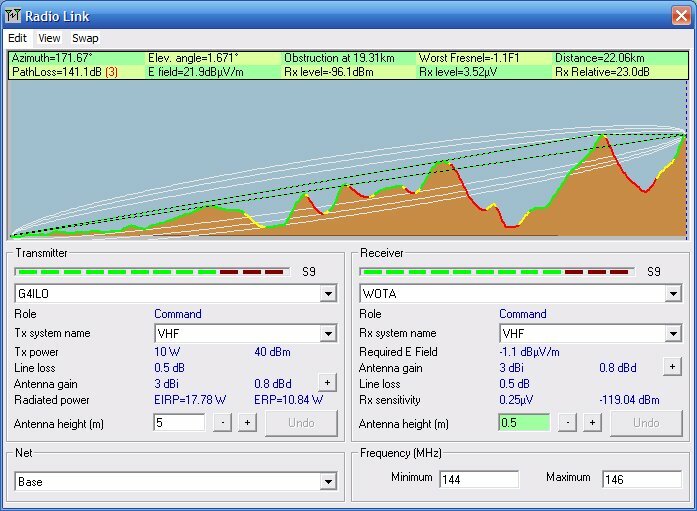 Digital modes such as WSPR and JT65A are time-synchronous and require the computer clock to be accurate to within a second. New users frequently don't realize this and find that they aren't decoding any signals. When they go to a forum for advice they are inevitably advised by well-meaning helpers to run a bit of software called Dimension 4. Once upon a time there may have been a good reason for using this program but today it is not a good idea at all. I have seen several forum threads where people have installed Dimension 4 and believed that their PC clock was now accurate, but were still not decoding signals. I suspect that this is because newer versions of Windows have tightened the security controlling whether programs are allowed to do things like change the system clock. Dimension 4, being last updated in 2004 according to its website, knows nothing of this. There may or may not be ways to make Dimension 4 work under Windows 7 or Vista but there is no reason to bother with them. Instead, just install Meinberg NTP for Windows. Not only is this every bit as free as Dimension 4, it is also the official Network Time Protocol client software. Nothing is ever going to keep your computer clock more accurate than this, and if installed using the default settings it will "just work" even on the latest versions of Windows. So please, computer Elmers, stop telling people who need to get their clocks synchronized to install an old and unsupported program. The RSGB has negotiated with Ofcom to allow UK radio amateurs to use a special call to celebrate the wedding of H.R.H. Prince William and Catherine Middleton. The call may be used during a period of 11 days from the date of the wedding, 29 April 2011, until 9 May 2011. The call will use the letter "R" after the first letter of the call, replacing the regional designator for Scotland, Ireland, Wales etc. where used. So G4AAA would become GR4AAA, 2E0ABC would become 2R0ABC, GM3ZZZ would be GR3ZZZ and so on. UK licensed amateurs wishing to use the special call must apply for a Notice of Variation (NoV) to their license. This NoV may only be applied for online using a simple online form and the NoV will be delivered by email. Who says that the RSGB is not progressive? Personally I will be trying as much as possible to avoid all the ballyhoo over this wedding so I shan't be applying, but I thought that the information may be of interest. I noticed that when you save a radio coverage image from Radio Mobile, the program also saves a KML file. 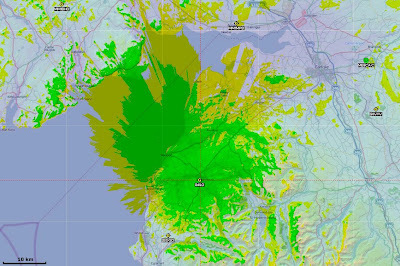 If you double-click on this it opens Google Earth superimposing the coverage map on the satellite view. The predictions seem pretty accurate from the summits I have worked (or failed to work) so far. Ten metres has been open this afternoon. I was alerted to this when someone on the Transmission1 radio forum mentioned that 27MHz was full of Russian taxis. I had a listen and sure enough their FM transmissions were clearly audible well up into the lower end of the amateur 10m band. This is one of the penalties of having CB radios that are easily modifiable for use outside their allowed band, I guess. And there's no chance of anything being done about it in Russia, the land where the Kalashnikov and the bribe determine the rules. I switched to SSB and quickly worked A61AM. One of the things I love about 10m is the number of times you hear a DX station, give your call and they come right back. I was not even running full power - 80w is normally all I use. True there were a couple of pileups apparently of pirates using calls that consisted of just two letters :) but I avoided those. 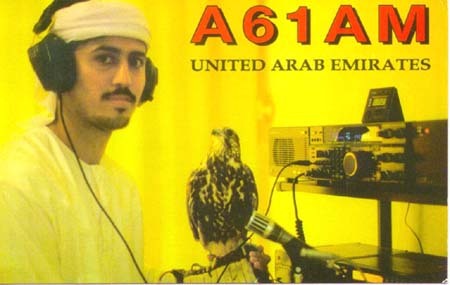 By the way, why is it that DX stations so rarely give their own call? Sometimes you have to listen for five minutes to hear it again and verify that you logged it correctly. Propagation was obviously good into Russia but I also worked Mike, SV5BYR on Rhodes, Barney ZS6TQ, Burhan TA1BX and Norman 5B4AIF. It's really great to hear 10m opening up, that's for sure! Amateur radio as we know it could be extinct by the year 2020. That is the only possible conclusion to draw from an unpublished EU policy document that has been leaked to several ham radio bloggers including myself. The document proposes that existing RFI standards protecting the short wave frequencies be torn up as "preventing the use or increasing the cost of essential technology in order to protect the activities of a small number of hobbyists makes no political sense." This policy has already been unofficially in place at the UK's Ofcom, which was one of the major contributors to the report. The report suggests that withdrawing the standards relating to short wave RFI would save significant costs by removing the need to deal with complaints about interference. It also suggests that the UK Telecommunications Act (and similar laws in other EU countries) be amended to remove any right to protection from interference of the broadcast, amateur or CB services. To support its recommendations the report claims that "short wave broadcasting is in rapid decline, with most broadcasters moving to the internet" and that "the intended use of Citizens Band as a personal communications service has largely been replaced by cellphone usage." Amateur radio, it says, carries "little communication of any importance that could not be made using the telephone, cellular network or the internet." The main use of ham radio, it suggests, is "largely recreational" and could be replaced by "online simulations and VOIP chat services." Hams could also make more use of the largely interference-free bands above 400MHz which otherwise could be sold to commercial users. 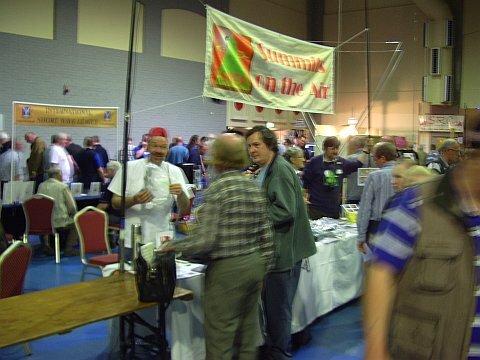 Radio amateurs "could still experiment with radio in the time-honoured manner, they just should not expect to be able to enjoy interference-free reception on the short waves." The reason for the desire to remove the protection of our frequencies becomes clear when you read the part of the report that describes forthcoming technologies that are expected to cause problems with RFI compliance. In order to meet carbon emissions targets and deal with expected power shortages caused by the early closure of nuclear power plants in countries such as Germany, the EU plans to introduce smart grids in all European nations by 2020. These smart grids use BPL technology to communicate with smart meters in each individual home. The smart meters, in turn, use PLT technology to communicate with smart devices in order to regulate their use. When demand for electricity is high, power cuts or the switching on of expensive standby power stations can be avoided by shutting off inessential devices instead. Examples of inessential devices given in the report include amateur radio linear amplifiers - assuming it's still possible to hear anything on short wave over the BPL and PLT QRM in the first place. The EU is also proposing that 80% of properties in member states should be equipped with solar panels by 2020. To achieve this target, installation costs will be heavily subsidized by governments, which clearly want to cut costs as far as possible. Estimates produced by a Chinese manufacturer of solar power systems suggest the cost saving that would result from eliminating the need for RFI suppression circuits in the power converters would amount to 4 billion Euro for the whole of Europe. The report concludes that "the cost of protecting the short wave spectrum from interference from technologies that are essential to be installed throughout Europe in the next decade to meet emissions targets and maintain the well-being of all European citizens is quite simply prohibitive" and urges that EU Commissioners pass the necessary laws by 1st April 2012.